I think it's time for a new mini make-over episode, how about you?! 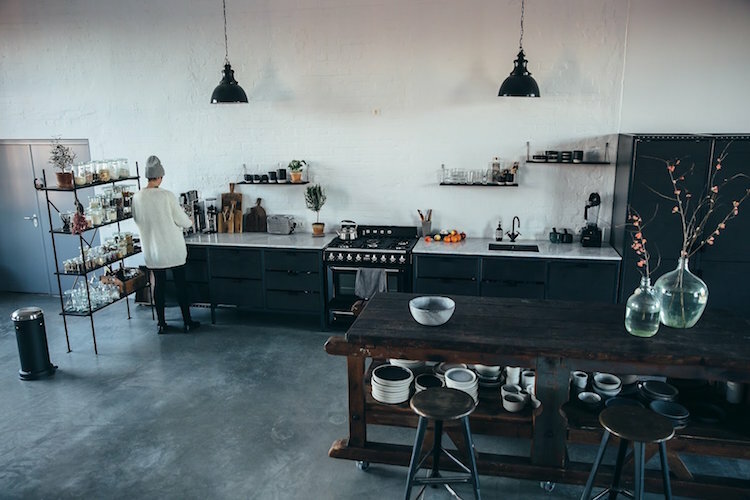 This time I thought we'd head to Berlin and the awe-inspiring studio of Our Food Stories and Design Tales (take a look at previous before + afters in the series here and here). 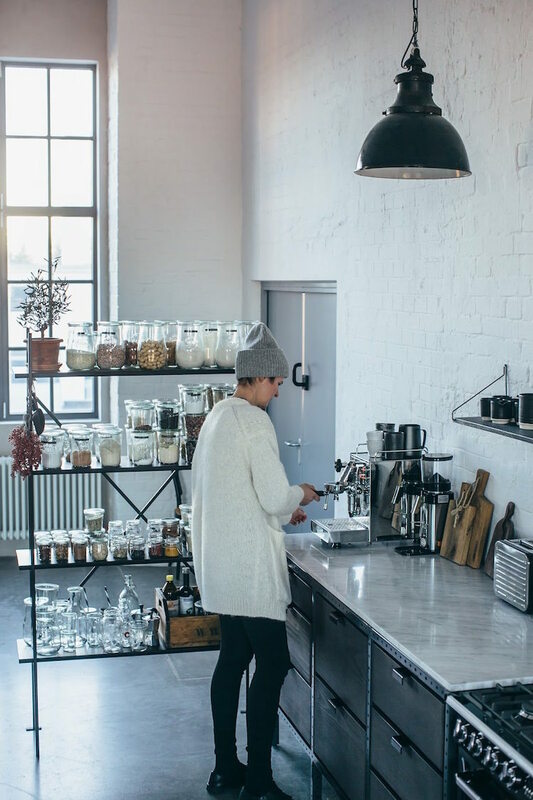 The brainchild of creative duo Laura and Nora, Our Food Stories is a culinary feast for the eyes and has garnered a following of close to 1 million Instagram followers who stop by each day to get recipes (read more about the pair and their work and take a look inside their homes in this interview). 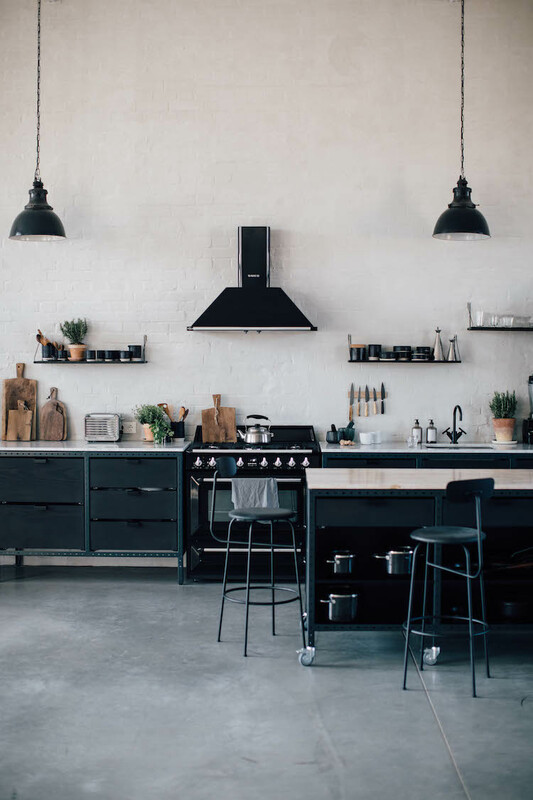 Let's dive in and find out how they transformed the first floor of a derelict warehouse into a stunning studio for cooking, food styling, photography, workshops and events. 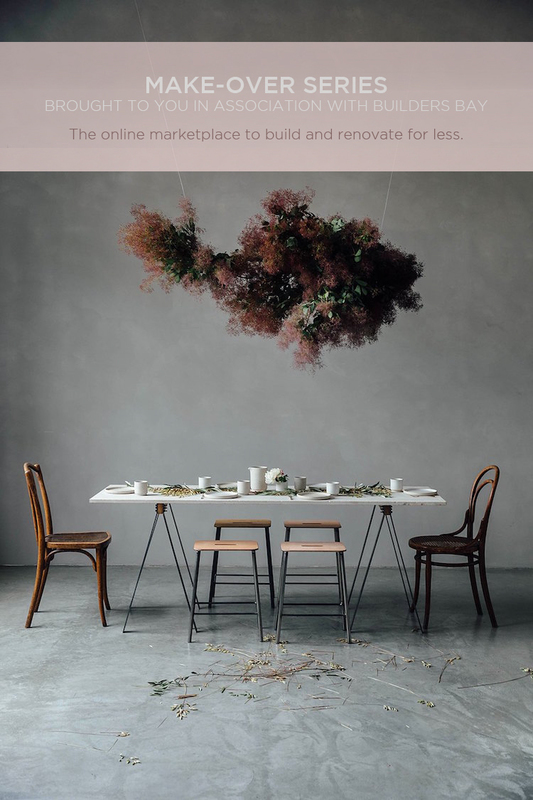 Oh and thank you so much to the series sponsor Builders Bay - an amazing online marketplace for builders, renovators and DIYers where you can buy and sell surplus materials, architectural salvage and ex display stock! Perfect! 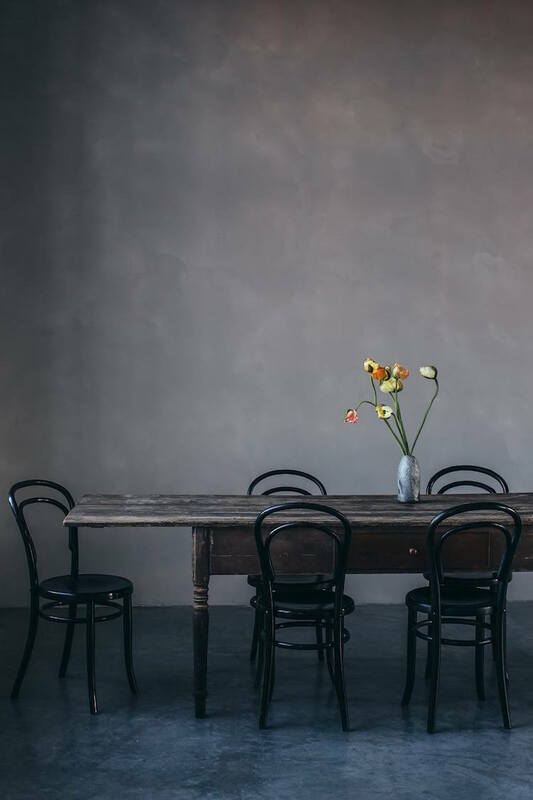 Our Food Stories started out five years ago from a small studio in the countryside, one hour drive from Berlin. The tranquil setting was wonderful since it offset the stresses and strains of setting up a business, "It really rescued us, since the first years of building up our own company have been so stressful." However, the blog became increasingly popular and they eventually grew out of it. 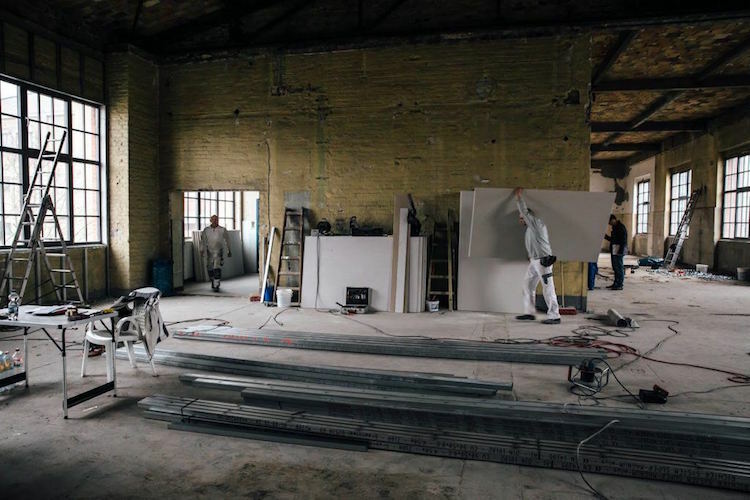 "It made sense to look for somewhere closer to home, so in the summer of 2015 we started to look for a Studio in Berlin." Since natural light is a key element in their photography, it was important to find a space with at least one North facing window. 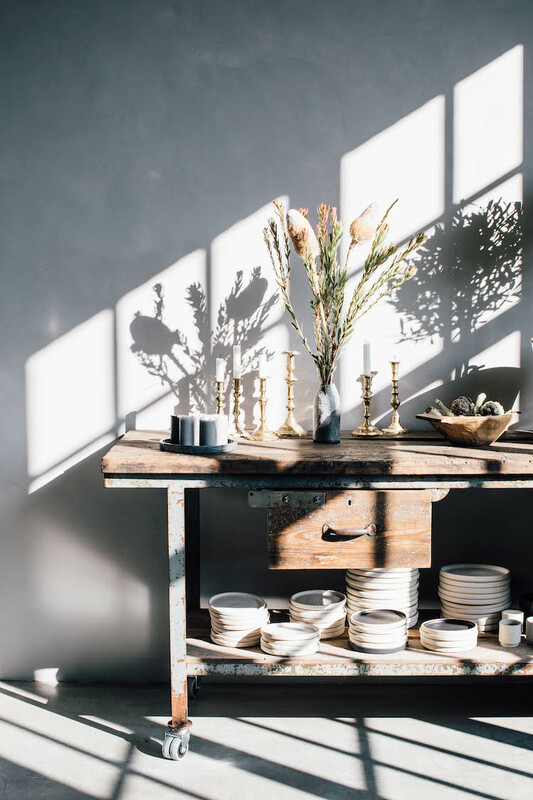 Known as 'reflected light', north light is popular among artists since it bathes the subject in the same cool ambience throughout the day - giving artists and photographers greater control over their work (this has got me thinking about using the North facing windows in my home more!). The space would also need a high ceiling to fit their enormous tripod! The pair went to view another property which wasn't quite right. However, from the window they spotted a building 500 metres away and immediately fell in love with the windows and the building which combined "nice and neat with old school charm". They passed by on spec and found that the first floor was still empty and had the perfect light (two north-facing windows) and height. Result! "When we saw the space for the first time we just could not believe it was still available to rent! The first thing we did was check the point of the compass and the second time we visited we brought some flowers and did a little test photo shooting." 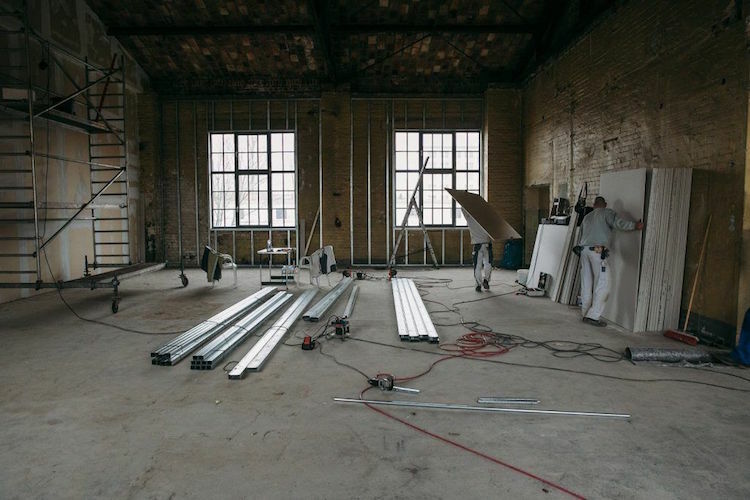 Despite the incredible shell, the space was in desperate need of renovation. The walls were yellow, and some walls didn't even exist. It also had no bathroom. Thankfully they would need to do little in the way of renovating themselves. "If you rent a studio or flat in Germany the landlord has to give it to you in a good (renovated) condition. As a renter you don't normally have a big influence on the renovation, but luckily we could decide on a lot of the details, which we are very thankful for. " 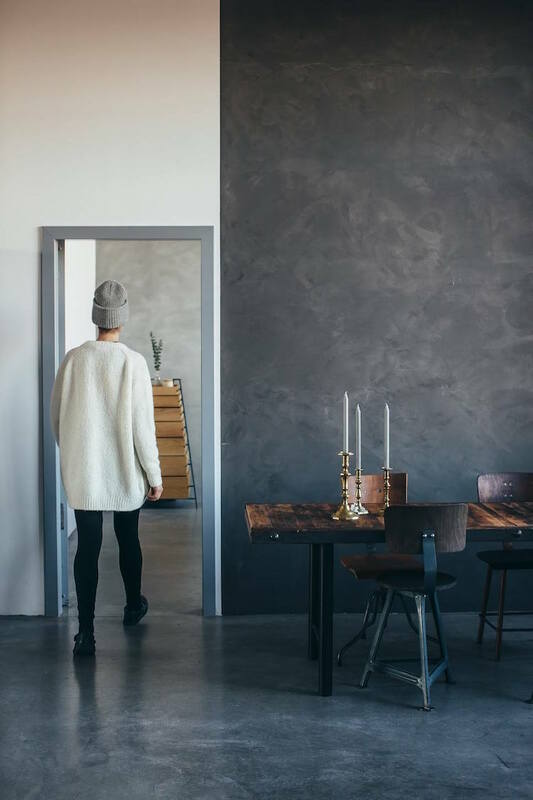 The landlord prepped and painted the walls (white) and, at the request of Laura and Nora, installed an incredible concrete floor. The original eight metre high ceiling was something of a photographers dream but they were warned by the landlord that their heating bill would be astronomical if they kept it and a result it was lowered by several metres. "We would never have lowered it, but the landlord told us that it would have been impossible to keep the space warm in the winter because the roof has no insulation." The pair used furniture and lighting to divide the vast room into a series of zones: "we created different corners, which allow us to create different set ups." But they were also keen to keep the space pared-back and clutter-free. "It’s very important to have a space that is not too packed, so when it gets messy during photo shootings, you still have enough space." Being food stylists and photographers, the kitchen was a major focus. 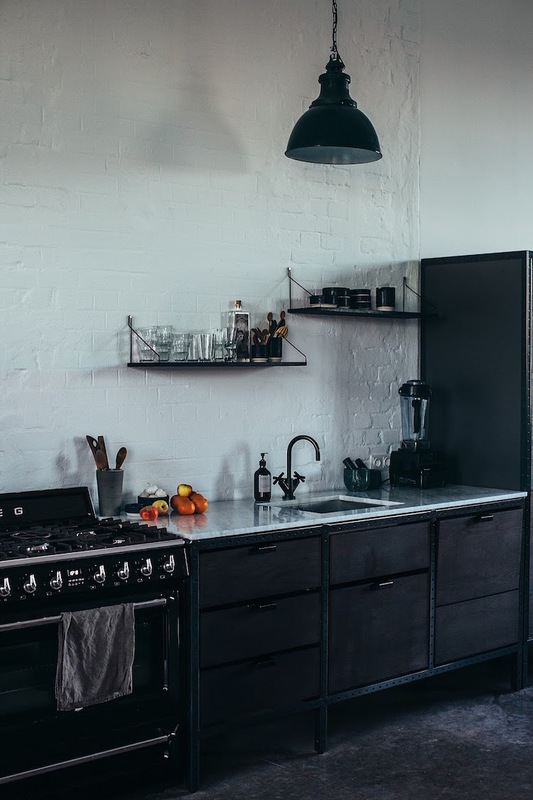 The pair spent a lot of time thinking about which kitchen to install, in the end settling on a kitchen from Frama. 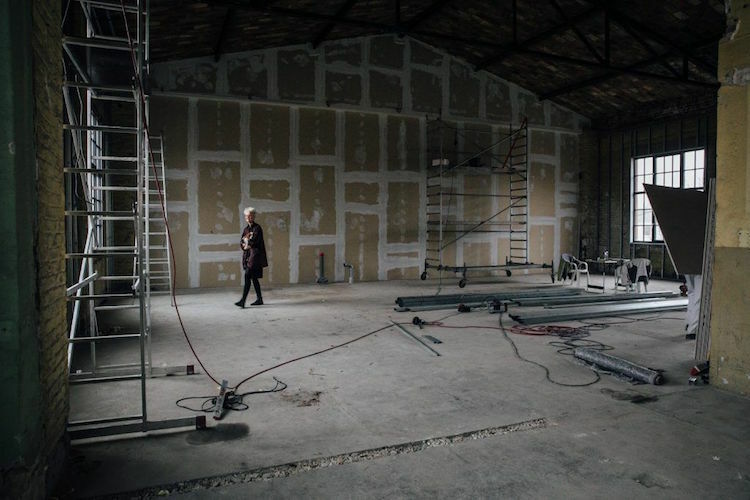 "It perfectly fits the industrial surroundings, we are so in love with it!" Despite the white finish, Laura and Nora are pleased that they can see the outline of the original brick wall. The lines / texture also help to break up the empty expanse. 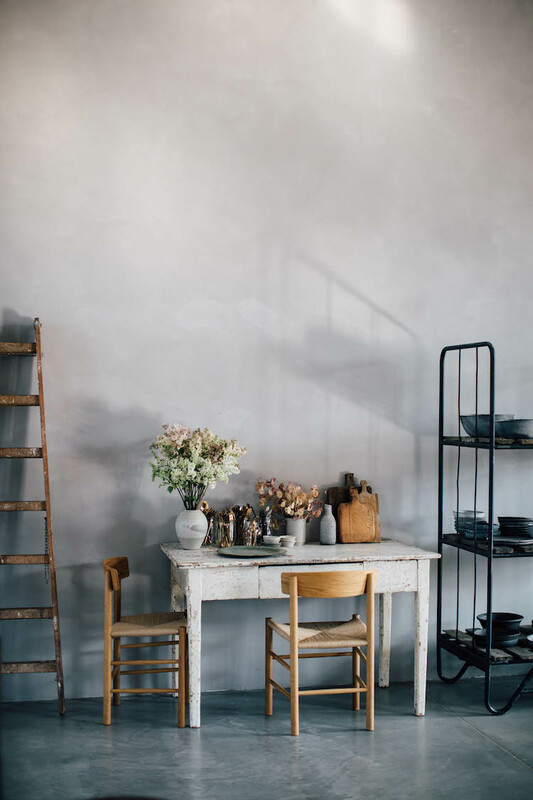 The pair had free reign to paint some of the walls and used paint from KABE Copenhagen to add nuance and texture. "We just chose by intuition which wall should get which colour." 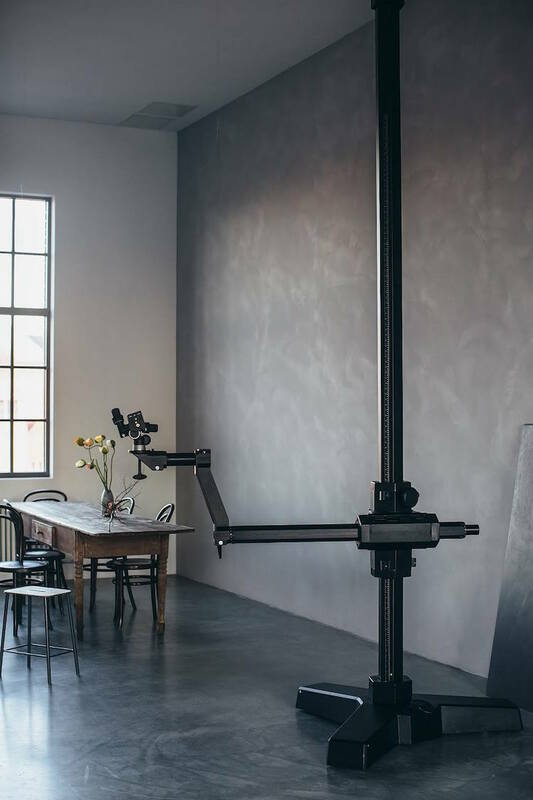 This mammoth tripod is one of the reasons they needed a studio with such a high ceiling! 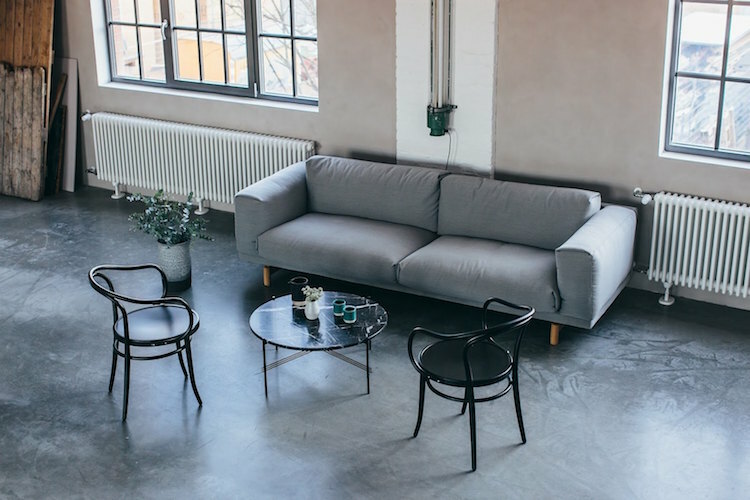 "The way we choose the style of the interior comes naturally and is also kind of indirectly dominated (in a good way) by the space itself, its aura and its architectural character." "We love the mix of old and new! 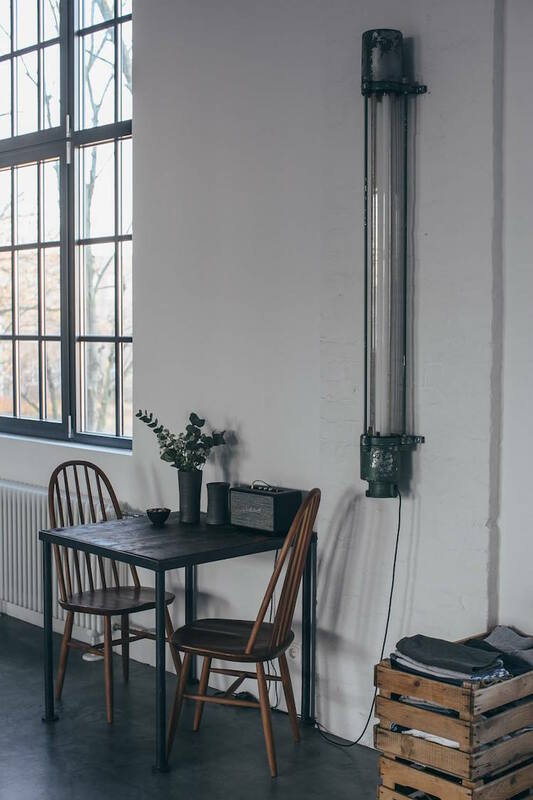 Our home in Berlin is more modern, with new danish design interiors, our home in the countryside more rustic, but also with a modern influence and our studio is kind of a mix of both with industrial elements." 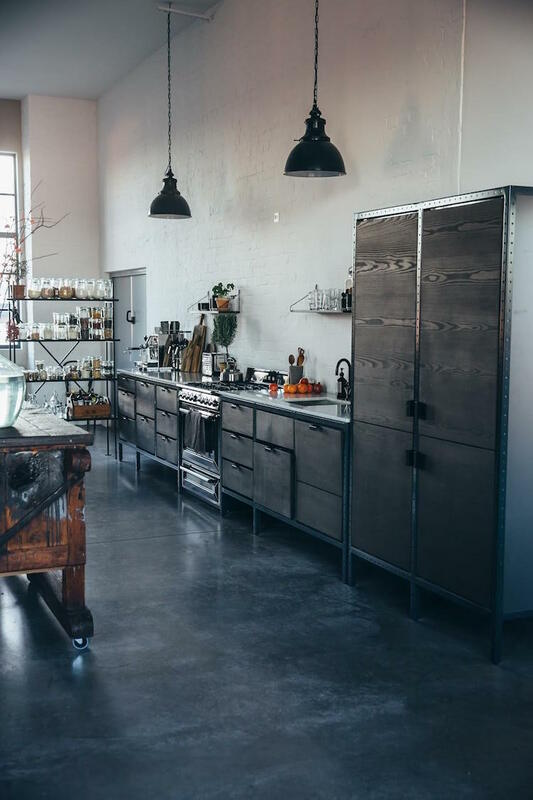 "Some of the vintage furniture is from Ebay and a lot of the old tables and lamps were bought from J&V and Urban Industrial." "We are so grateful and happy to work in this wonderful space." Just WOW!! This is my absolute dream (I wonder if they need a kitchen hand - or even someone to do the washing up?!). Could you imagine settling in here each day? The pair love to collaborate with other local talents. 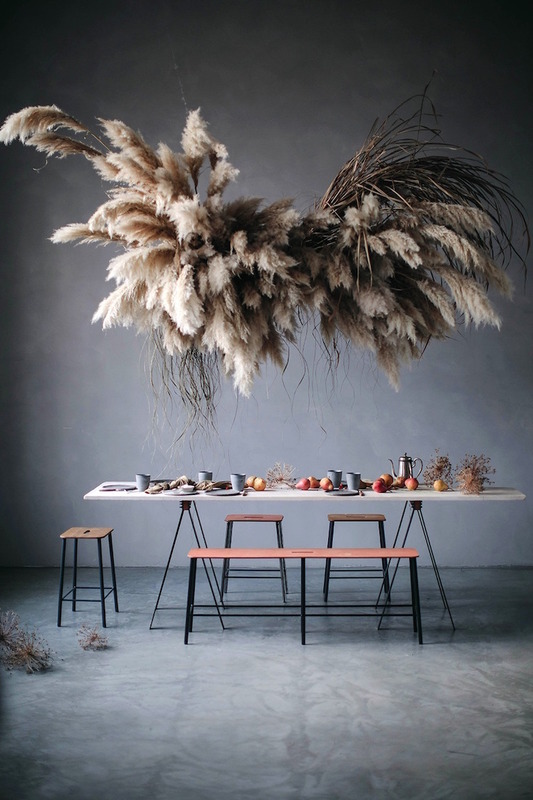 This incredible pampas cloud installation created by Mary Lennox spread across Pinterest like wildfire back in the autumn (it's easy to understand why!). But the key focus remains on the pairs passion for food so I was dying to know if the girls had a favourite recipe! I was told this was an extremely tricky question, since they love them all, but at a push Laura would go for the gluten free quince cheesecake with meringue and Nora the gluten free poppy seed cake. 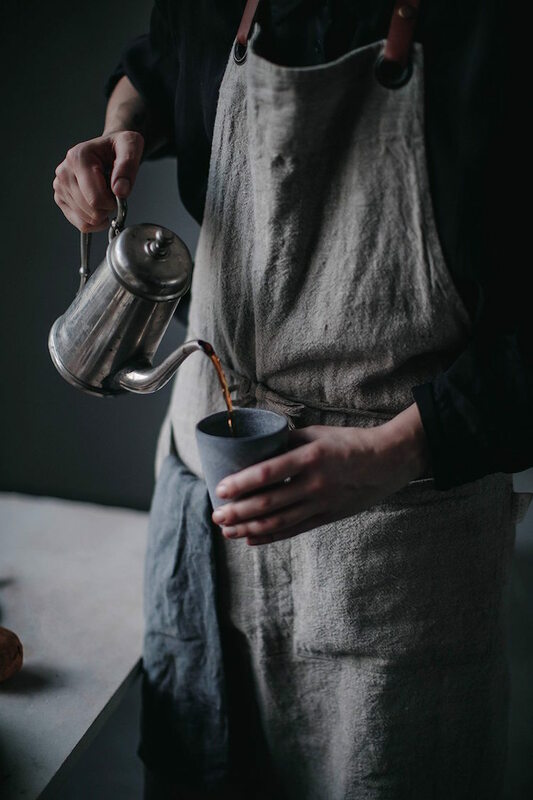 For more mouth-watering recipes you must follow these ladies over on their blog and instagram: @ourfoodstories, and @designtales for interior inspiration! They also have a beautiful book available here. Which leaves me with one question. 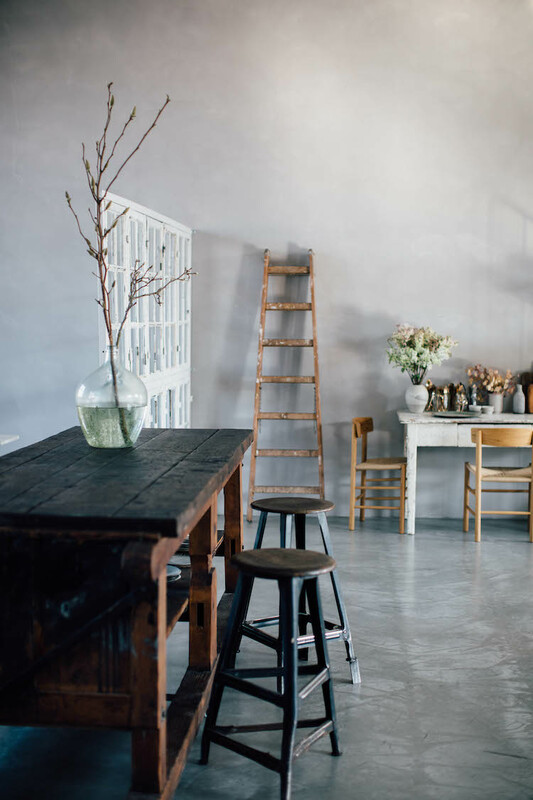 Hands up who'd love to work from a studio like this and eat lots of cake?! Thank you so much to Laura and Nora for showing us their studio! * All words are my own, and I only ever work with brands and services I feel are of interest to my readers. 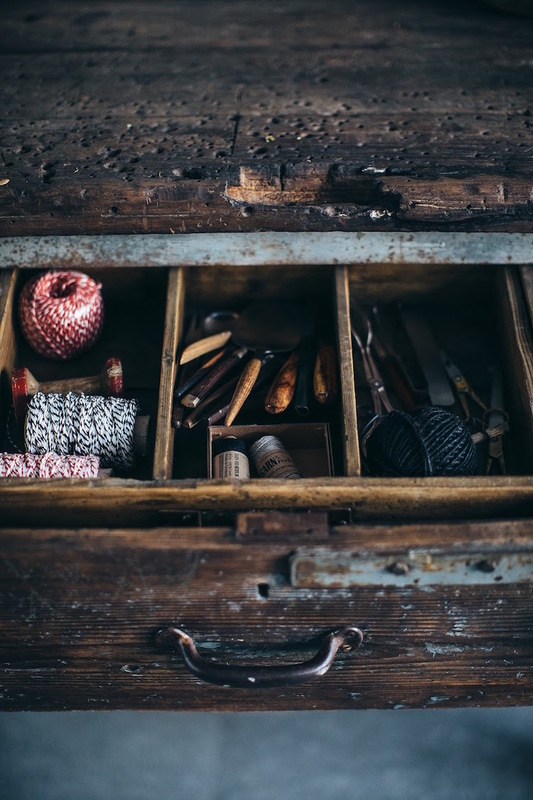 This post also includes affiliated links which means that I make a very tiny amount of money (perhaps enough for a coffee and a choccy biccy from each post!) if you click or buy items. Thank you for supporting the businesses that make My Scandinavian Home possible. Wahnsinn, wie toll die Räume gestaltet sind! Tolle Wohnaccessoires! Not my skills unfortunately - all credit goes to Laura and Nora (and I'm amazed by their skills too!). Useful tips given here and great to here about make over for house.